Seems like there was a robbery at the corner of Washington and DeKalb Avenue tonight. The scary parts of this incident was that: It was an armed robbery. The assailants were extremely young. Now, please note that I did not witness the actual events. I was walking home when I noticed a Police car parked the other way and various personal contents on the ground. From what I could gather briefly from the victim and some people who were in the area when it happened it sounded like the victim, a teenage Puerto Rican male around High School age, was approached by 3 even younger Black teens with one of the attackers pulling a small handgun out and shoving it into his stomach. I guess some screaming/shouting occurred and someone on the street quickly called the Police. One of the witnesses indicated another recent incident where a young Pratt student was recently robbed in the same manner in the same vicinity. 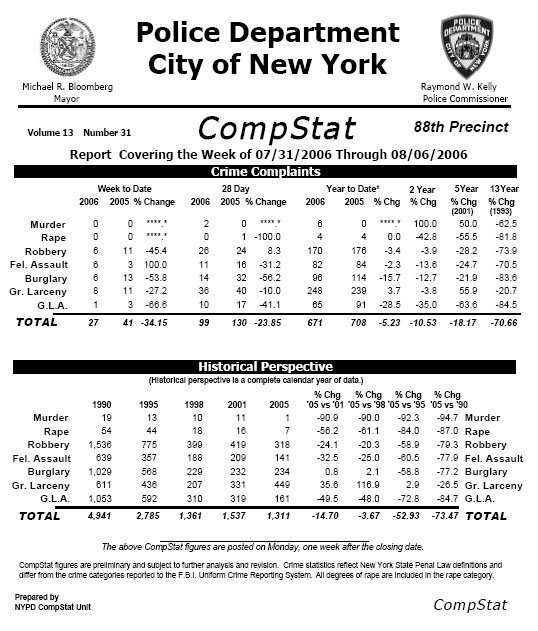 A quick look at the 88th Precinct Crime statistic indicates crime being down but with the students at Pratt returning, Freshmen orientation seemed to have occurred this week, I'm expecting a slight increase. With all the development going on this could be a backlash effect as a lot of people who have lived in this area for a long time are suddenly being priced out of their own neighborhood. Just a little head's up for everyone as I got a feeling it's gonna get worse before it gets better.